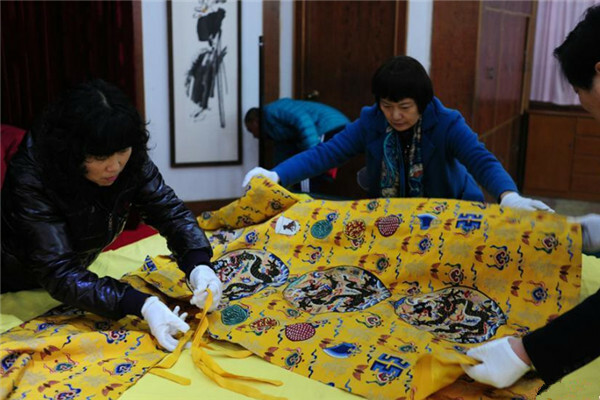 Replicas of silk clothing from the Ming Dynasty have been moved to Beijing. They came from Nanjing, where craftsmen painstakingly remade the silk finery. A ceremony marked the occasion and offered a glimpse of the handiwork. And an exhibition at the Louvre in Paris centers on the Syrian city of Palmyra. Preservation of the city’s ancient ruins has become ever more desperate, now that the area has turned into a battlefield between Syrian government and rebel forces. 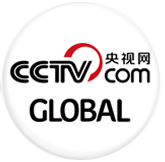 Nine sets of silk clothes and accessories—replicas shown with authentic originals from the tombs of Ming Dynasty emperors—have been shown at the Ming Tombs, in suburban Beijing’s Changping District. The elaborately-made replicas present a clear image of what emperors were given to wear during the afterlife. Craftsmen from the Nanjing Brocade Institute made the replicas. They came to the Ming Tombs many times to draw from original relics and search for books. They even restored colors according to notes made by the archaelogists who dug up the tombs. The project took two years to complete. Emperors wore the yellow and red robes during the most important occasions, such as sacrificial ceremonies and big celebrations. The red one contains auspicious Chinese characters, while the yellow one has curling dragons on it. Replicas of silk clothing from the Ming Dynasty have been moved to Beijing. With the clothes and robes, and also cloth knee protectors, there is an abundance of colors and patterns to delight the eyes. A public exhibition is expected to follow, though no dates have been announced. And then in Paris, an exhibition at the Louvre aims to make more aware of the glorious past of Palmyra. This is the Syrian city noted for its rare and ancient ruins. But now it is known for the trauma it has experienced during the country’s six-year-old civil war. Palmyra, around 200 kilometers northeast of the Syrian capital Damascus, is an ancient city with a proud history of more than two thousand years. Its grandiose city ruins had managed to survive the ages—until it became part of the battlefield. Many ancient monuments have been destroyed since extremists occupied the city in May 2015. The city was recaptured by the government in March. The videos shown at the exhibition were shot in April with the help of a drone. “With the assistance of the Syrian people, and using drone photography technology, we were able to shoot the videos of Palmyra in just four days. This was only shortly after the extremists were driven away by government forces,” said the exhibition curator. Dubbed the “Bride of the Desert,” the city is an oasis in the desert. Ruins like monuments and temples are testimony to the city's past glory as a wealthy trading center, dating back to Roman Empire. Before being sucked into the vortex of warfare, the ruins were one of the region’s most popular tourist attractions, drawing tens of thousands every year. Syrian preservation officials say they are afraid extremists will retake the city and then exact a vicious toll. Although all the relics of the Palmyra museum have been transported to Damascus, the ruins themselves are still under threat.